The maximum loan amount for Illinois residents will be $2,400.00. In accordance with Illinois law, your loan must be paid in full through scheduled installments over 180 days (6 months) or less. You may make an early or partial payment on your loan at any time with no prepayment penalties. 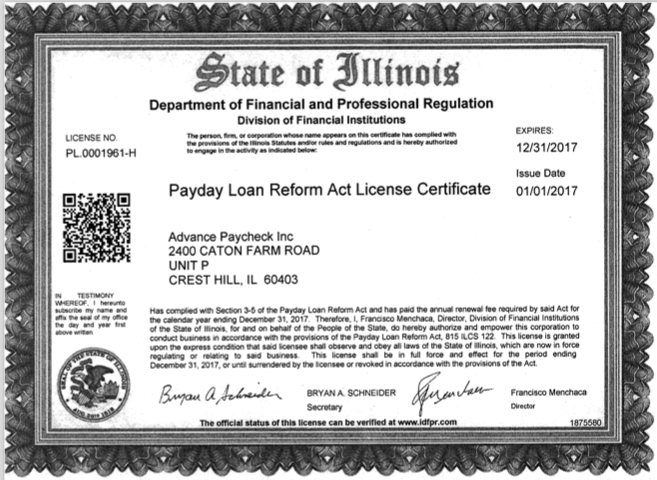 By Illinois regulation, all Illinois customers must have a pay stub on file with Advance Paycheck when receiving a loan. Please fax or e-mail your latest pay stub when applying to ensure quick processing of your loan. If you receive income by means other than an employer, please fax or e-mail other proof of your Social Security, disability, child support or alimony payments. All materials may be sent via fax to 815-846-0924 or via email to support@advancepaycheckonline.com. As soon as we receive this, we will be able to complete your loan request. The table below illustrates the finance charge and APR of a $400 installment-payday loan due in 6 installments of 30 days each. The cost of your credit as a yearly rate	 The dollar amount the credit will cost you	 The amount of credit provided to you on your behalf	 The amount you will have paid after you have made all payments as scheduled	 The number of individual payments you will have made until your loan is repaid in full. This loan is not intended to meet long-term financial needs. This loan should be used only to meet short-term cash needs. The cost of your loan may be higher than loans offered by other lending institutions. This loan is regulated by the Department of Financial and Professional Regulation. 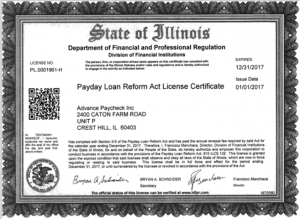 If you still owe on one or more payday loans, other than an installment-payday loan, after 35 days, you are entitled to enter into a repayment plan. The repayment plan will give you at least 55 days to repay your loan in installments with no additional finance charges, interest, fees, or other charges of any kind. The loan agreement will be governed by the applicable laws of your state. Questions or complaints should be directed to your state’s regulatory agency. Click here for contact information.